Today's modern anesthetic monitors have made surgery much safer than in the past. Here at Northland Veterinary Services, we do a thorough physical exam on your pet before administering anesthetics, to ensure that a fever or other illness won't be a problem. We also adjust the amount and type of anesthetic used depending on the health of your pet. We offer two levels of in-house blood testing before surgery, which we will go over with you when you bring your pet in. Dr. Brilla prefers the more comprehensive screen, because it gives her the most information to ensure the safety of your pet. For geriatric or ill pets, additional blood tests or x-rays may be required before surgery as well. For dogs, we may recommend an oral anti-inflamatory the day after surgery and several days after to lessen the risk of discomfort and swelling. We use newer medications, which are less likely to cause stomach upset and can be given even the morning of surgery. 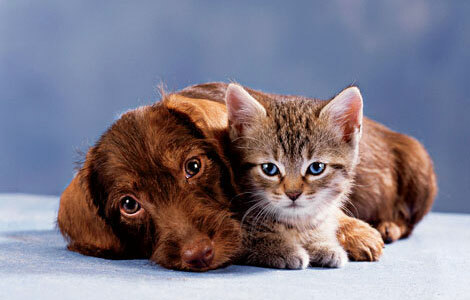 The cost of the pain medication is included in the price of routine spay/neuter procedures. For all other procedures, the cost will be determined by the weight of the dog.